This exemplar development of 14no passivehaus dwellings was designed and delivered by certified passivhaus architects at Hamson Barron Smith for Broadland Growth Ltd, a company set up by Broadland District Council and the NPS Group. The properties have been carefully grouped so the development sits comfortably in its woodland setting. The architects engaged with CNC Building Control on pre-planning submission in 2014 to facilitate an early dialog on the project. As soon as the detailed technical design was under development constant interaction occurred between building control and architects. During plan checking, particular care was taken with regards to Part L and the increased energy efficiency requirements. Ultimately a full set of detailed technical drawings along with full structural and civils packages were issued to CNC. 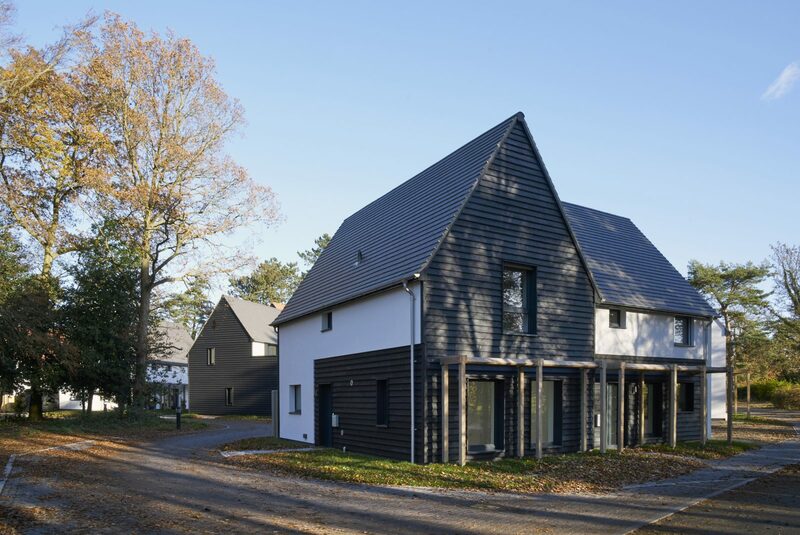 By meeting the demanding Passivhaus standard on all of the homes the project surpassed the requirements in the new part L, and achieved air test results that ranged from 0.2-0.5 ACH @50pa. This project was innovative in its design, achieving full Passivhaus certification on a scale rarely seen in the UK. Achieving a thermal bridge and draught free building envelope, exceeding regulations for airtightness five times over. Air test results ranged from 0.2-0.5 ACH @50pa. And the homes will use ≤15kWh/(m2a) of heating energy, while maintaining perfect constant temperatures all year around. The positioning and orientation of the homes maximises the access to solar gain in winter and prevents over heating in summer, with brise soleil and venetian blinds reoccurring across the design to provide solar shading. Fresh filtered air is provided to the homes, utilising a heat recovery system capable of achieving over 90% efficiencies. All homes have electric car charging points, rainwater butts, connection points for PV and are compliant with the recommendations of the National Housing Standards Review. A woodland path has been built for the local community, (forming a green corridor between Norwich City and Drayton woods) an animal haven has been provided and a woodland management plan will be created involving local residents. The development provides a new footpath to the nearest bus stop to improve accessibility to Norwich for this and future development sites. The development is the first to be served by the waste management contractor in Broadland on a permeable surfaced access road. The development of the site for housing was not straight forward as it was located outside the defined settlement limit and heavily constrained by trees. The project had to be sensitively managed to overcome several planning challenges associated with trees, ground conditions, open space requirements, refuse/servicing, archaeology, highways and viability issues to ensure the scheme could be delivered within a very tight timescale and within the cost estimates. The client objective for this project was to deliver a mixed tenure scheme providing affordable housing for the local community which exceeds planning requirements and is truly tenure blind. It has delivered a unique selection of contemporary homes set within a mature woodland. 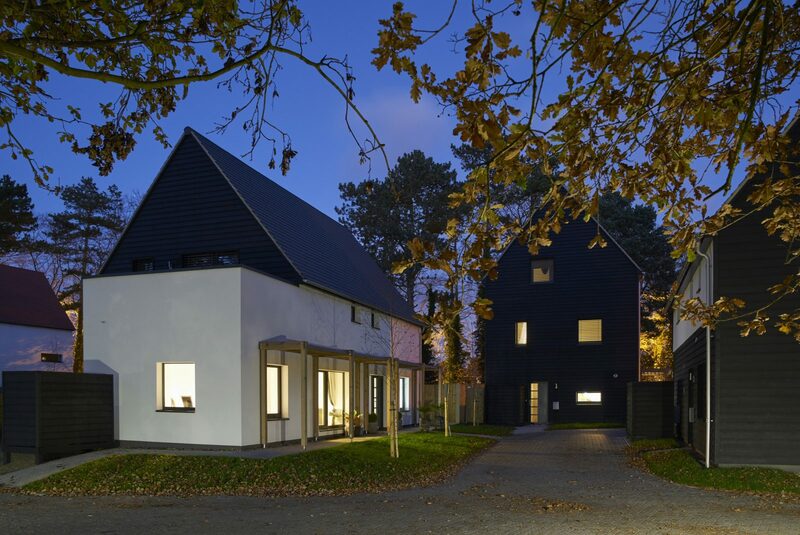 These homes are at the leading edge of low energy design, joining a small elite group of super low energy Passivhaus projects across the UK and act as exemplars for future development in the area and beyond. Since completion, the scheme has been successful on several different award fronts including a RIBA National Design Award, RTPI Award for Excellence in Planning to Deliver Housing and the Housing Design Award (HDA) DEFRA Award for Rural Housing. It also won the Best Housing Development Award at the Regional LABC Building Control Awards and is a finalist for the coveted National award which will be determined in November. Photographs courtesy of Jefferson Smith.